Task: To create a bevelling machine that produces weldable edges on large diameter tubes. This involved sourcing a CNC as well as developing a graphical user interface (GUI) that would make operating the machine easy. Solution: Use a FANUC CNC to develop a new generation of machine capable of creating any required bevel profile, regardless of tube thickness. To coordinate the machine’s U and C axes extremely precise encoders and fast CNC processing were a must. 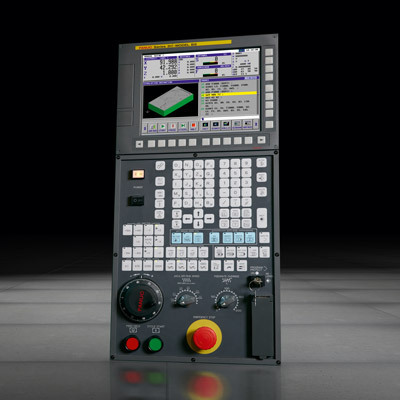 Given that operators had little or no experience of CNC, the solution also took advantage of the ability to develop a GUI using Fanuc Picture Software within the CNC. Result: The solution was developed using the FANUC CNC after Copier Bevelmachines identified it as being the most suitable for the application. The machine is very easy to use. All operators need to do is enter the parameters of the tube and select the desired bevel profile with the aid of the graphic displays. This allows the operator to control the machine without having to deal with the underlying NC code. To perfectly weld tubes to each other, their ends must first be machined to create a profile that can be filled during welding. Copier Bevelmachines of Giessen has created special bevelling machine to produce a weldable edge for this purpose. The company turned to FANUC not only to provide CNC controllers but also to develop a GUI that would greatly simplify operation of the machines. What sets these bevelling machines apart from other turning applications is that it is not the workpiece that rotates but the tool itself. The reason is that the machined steel tubes are long and have diameters that can be up to 48 inches and with a tube wall thickness of anything from 60 to 70 mm. These heavy workpieces are fed into the machine on a roller conveyor then fixed in place with a triangular auto-centering locking block. The end of the tube is machined with the aid of cutting inserts that are fixed to the cutting head of the machine. It is thus the tools that turn during machining and not the workpieces. Copier, which was established by Jan Copier in 1997, has rapidly grown to become a major player in this niche market. Copier invests in quality and reliability but also attaches a great deal of importance to ease of operation, an aspect in which the FANUC controllers will now play a big role. The big advantage of this system is that it’s very simple. The drawback is that special cutting inserts are required and that each form can only create one bevel. Moreover, the thickness of the tube wall may not exceed a certain size. To meet these requirements, a new generation of machines has been developed in which the cut is managed by a CNC controller. The cutting inserts are no longer fixed to the spindle but are mounted on a carriage (U axis) on the spindle head so that they can be moved inwards or outwards as required. This U axis is driven by an especially designed mechanical transmission that turns with the C axis, which is also driven by an additional power axis. The CNC machine can create any required bevel profile, regardless of the tube thickness with the same tools and cutting inserts. In addition, supplementary machining such as threading or grooving is possible.